I’ve just listed a bunch of new BabyHawk and ToddlerHawk mei tai carriers, and I have more on the way! I have a hard time stopping once I get going putting panel fabrics and strap colors together. There are some beautiful reversibles available as well — like getting two carriers for the price of one! 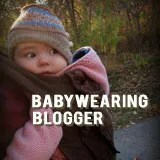 I’m using both my BabyHawk and my ToddlerHawk almost daily with my 5 month old baby; I love the comfortable padding in the shoulder straps, the supportive headrest that can be folded up or down, and the versatility of being able to wear my baby on my front or on my back. All BabyHawks and ToddlerHawks ship free in the US; international orders get a $5 rebate on shipping charges.